The Montessori Compass team is pleased to provide a sophisticated and comprehensive mapping to the Common Core State Standards (CCSS). Developed in collaboration with Tim Seldin and the Montessori Foundation team, this mapping is the first of its kind to demonstrate how a robust Montessori Scope & Sequence maps to the defined Common Core Standards for English Language Arts and Mathematics from Kindergarten through Grade 6. While the concept of the Common Core remains a very controversial topic amongst the leadership in the Montessori Community (the Montessori Foundation is among that leadership that does not advocate for externally-mandated standards), it is a reality that must be addressed. Our goal with this collaboration was to develop the necessary combination of a sophisticated mapping along with a technological solution that will enable guides in the classroom to remain focused on the Montessori Method, without the distraction of standards. What makes this mapping particularly unique are the measurable learning objectives (elements) that we utilized in the Montessori Scope & Sequence. It was the very comprehensive nature of the Montessori Scope & Sequence that made it possible to provide a truly elegant mapping to the Common Core. 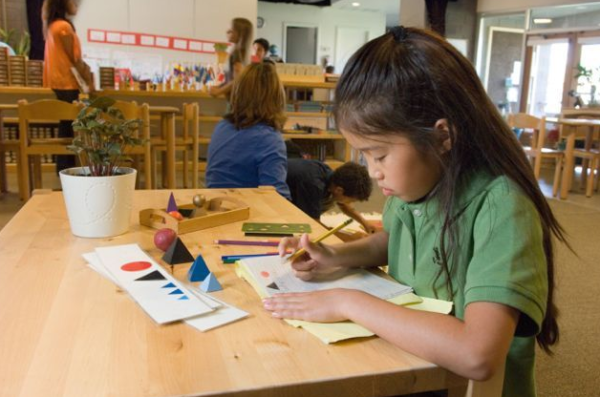 Associating a loosely defined relationship between a simplistic list of Montessori classroom materials and defined standards is simply inadequate and inaccurate. This mapping takes into account the very specific measurable learning objective that the child was engaged in during his/her work time and maps that precise activity to the appropriate standard(s). The end result is an accurate mapping based upon meaningful classroom data that demonstrates the many strengths of the Montessori approach to education. In addition to exceeding the objectives we set forth with our collaboration, some very intriguing insights have also emerged that may represent a unique opportunity for Montessori to gain greater attention in the public sector. For example, the common practice of introducing squares and square roots at the Upper Elementary level, results in Montessori students meeting some of the defined Mathematics standards as much as 4 years ahead of their traditionally educated counterparts. This has all been taken into account with our mapping. We are providing the Kindergarten, Grade 3, and Grade 6 Common Core mapping in both English Language Arts and Mathematics for free to the Montessori community. Montessori Compass subscribers will have access to 7 years of Common Core mapping (Kindergarten through Grade 6). In addition, cross curricular as well as cross-grade level mapping has been taken into account. That means work a student completes in other areas of the Montessori classroom such as Sensorial, Practical Life, History, or Geography may have been mapped to meet a related standard in either English Language Arts or Mathematics. Works that a Montessori student completes in a cycle year that is ahead of traditional “Grade-level” in the context of the Common Core is also accurately mapped. Click here to learn why the Common Core State Standards may represent an opportunity for Montessori to shine! *The Scope & Sequence and CCSS mapping is licensed for exclusive use within the Montessori Compass online record keeping software. It is not available to be printed or downloaded.